In Dead Island: Survivors, you will need resources like metal to boost towers and duplicate cards to level up your original trap/hero cards. Cash can be used to purchase your favorite cards to upgrade traps and heroes. For example: to get an extra Marshanda card, you will just have to spend 100 cash or to get the auto-turret card, you will have to shell out 200 in-game bucks. Just tap shop > cards and to buy them. You may have to wait 10-12 hours to get a new list of cards. You will also get a free daily suitcase that contains common and rare cards and 300 bucks. 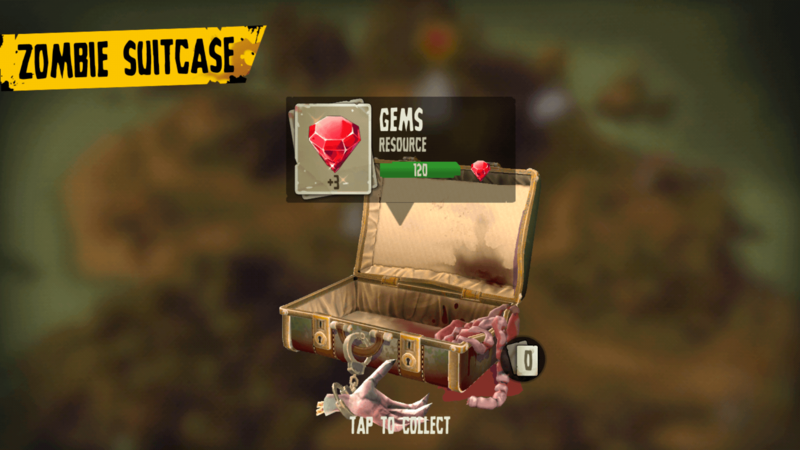 Gems are used to buy suitcases, which contain more rare cards, lots of cash and metal. There are several ways to receive gems, card, cash and metal and this guide will help you understand how to get them for free. You will also learn how to switch between islands in search for rewarding missions. Cash is used to level up trap and hero cards, and metal is used to boost traps on a map. You can get them by finishing “Loot Horde” missions. They are easy to complete. You will receive 900 metal and 60 cash for completing an easy mission. You will also receive an ordinary suitcase that contains bonus cash and cards. You might also get a rare card. 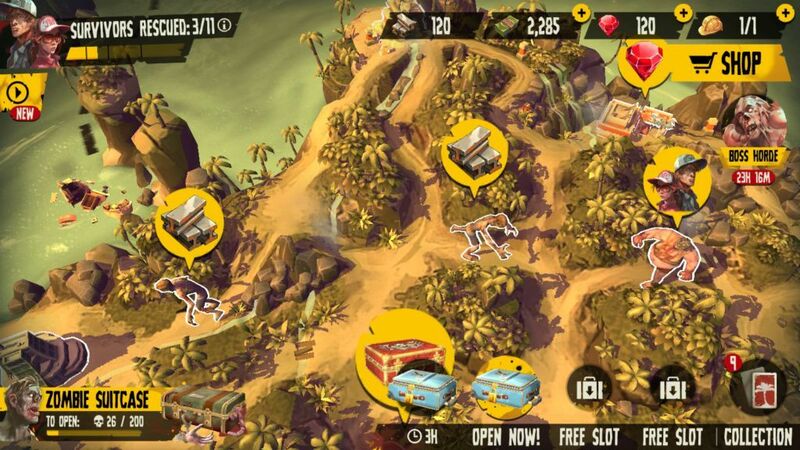 Tap the metal icon above an animated zombie in an island to play the loot horde mission. You won’t receive metal from a survivor horde mission, but you will get lots of cash. Survivor horde missions are tougher than loot horde missions, but there’s also a high chance of getting better quality suitcases that contain more cash and cards, including rare cards. You priority should be to complete easy loot horde missions to get lots of metal, cards. Use them to upgrade towers and heroes and then try to attempt survivor missions. 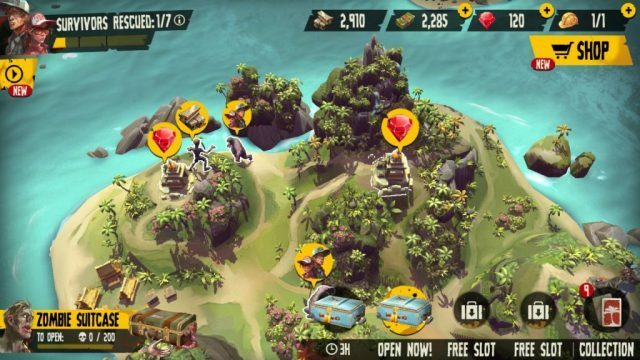 Once you complete a mission, you will have to wait for some hours before new missions start appearing on the island. You can leave your current island and move to the previous island in search for new loot missions. Leaving the current island would mean abandoning survivors and as a penalty you will be blocked from entering another island for 24 hours. To move to a different island, tap the tiny info (i) letter on the upper-left corner of your home screen. You can find this next to “Survivors Rescued”. Next, tap “Leave Island”. You will receive a warning. Tap the button again to confirm. You can now zoom in to the previous island and then tap the gem icon above a structure to finish a mission. What are Loot Missions and How to Get Gems from Them? Gems can be used to speedup trap upgrades or purchase premium, luxury and royal suitcases. While upgrading a tower on your map, you can tap the fast-forward button and use gems to skip the time required to finish an upgrade. You can also use them to open suitcases instantly. The time required to open a suitcase depends on its rarity. An ordinary suitcase takes 3 hours to unlock whereas a superior suitcase will take 8 hours to reveal what’s inside it. You will require fewer gems to unlock an ordinary suitcase. You can earn gems by completing special loot missions in Dead Island: Survivors. Loot missions are different from regular “loot horde” missions. They have a gem icon above structures on an island map. You can access a special loot mission by tapping this icon. Start with an easy mission. The difficulty level can be seen on the info card. You will get 2-3 gems for finishing an easy mission. The higher the difficulty level, the more gems you will receive on completion. Reactivate missions aren’t easy to finish. You will have to repair traps as you stop zombies from reaching the fence. Defending the gates can be difficult because there’s a cooldown time after repairing a trap. When you fix the first tower, start attacking incoming zombies by moving closer to repaired trap to force them to stay near it. This way, you can deal double damage to enemies. You will have to keep them busy until the cooldown timer is over. Start repairing the first or second tower to deal initial damage and then move on to the next once the cooldown time is over. Supply missions are a lot easier. You will have to search for crates, tap to collect them and toss them on a truck. All you have to do is avoid zombies while searching for crates. If they spot your hero, you can fight them, flee or lure them to explosive barrels. A supply mission is time-based, so you will have to complete your job before the timer runs out. However, you won’t have to collect all crates to finish a mission, which is quite unlike reactive missions, where gems are awarded only when you eliminate all zombies. You can still earn gems if you collect 3-4 crates. You will get all gems if you toss all crates into the truck. Kill 200 zombies to open the zombie suitcase. You will receive cards (1x rare card and 6x common cards), 75-100 cash and 3 gems. You might also get gems by rescuing people in an island. Tap the player base close to the ship and then tap “i”. You will open a new “Transmissions” page where you can see how many people you have rescued so far. You will get rewards after reaching a certain survivor rescue target. For example, in island 3, you will get a crate after rescuing 2 survivors and then get another after freeing a total of 4 people. You will get 10 gems once you rescue 7 people. Try not to waste gems to speedup opening a suitcase or upgrading traps. Save them to open high quality suitcases to get more rare and epic cards, cash and metal. Go to “Shop” to buy suitcases. 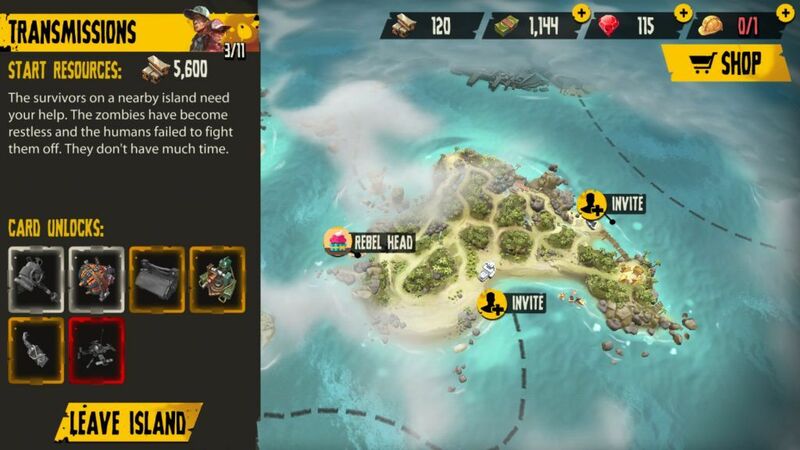 Boss horde events in Dead Island Survivors are available once in a day and are very hard to finish. But with rewards such as 5000 cash, 5 survivors and a legendary suitcase, it’s worth the risk. 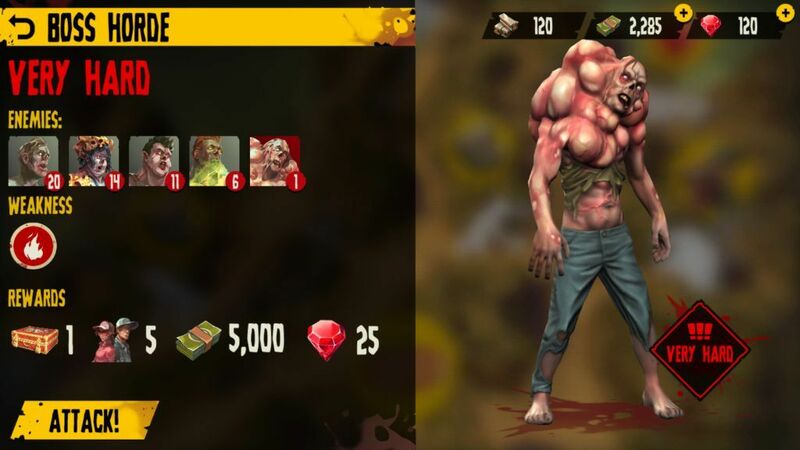 In events such as this, you will face a high HP boss, along with several other zombies. It won’t be easy to kill him, unless you have a powerful set of traps and a strong hero. Play easy loot missions to get cash, cards and metal and then use them to upgrade cards and towers. The boss horde event icon is located on the right side of the screen. Tap it and then tap the attack button on the info screen to begin playing. Our basic strategy guide might be of some help to fend off zombies in an event mission.